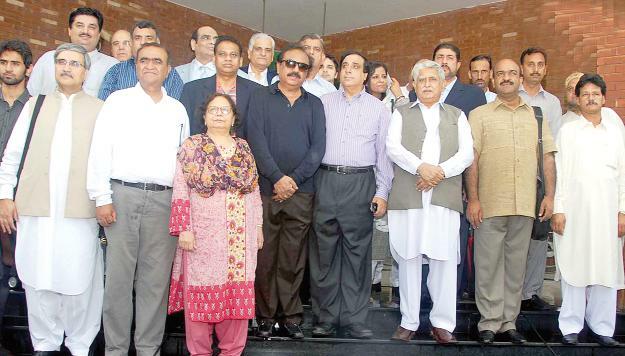 An 18-member parliamentary delegation left for India through the Wagah border on Wednesday. PPP Secretary General Jahangir Badr and Chairman of Senate Committee on Foreign Affairs Haji Adeel jointly headed the delegation comprising MPs from all major political parties including the PML-N, ANP and the MQM. The delegates include Senate Deputy Chairman Sabir Baloch, Nadeem Afzal Chan, Zahid Hamid, Khurram Dastgir, Nafeesa Shah, SAARC Chamber’s Vice President Iftikhar Ali Malik, PILDAT Secretary General Ahmar Bilal Mahboob and Irfan Khokhar. During its week-long stay in India, the delegation will hold meetings with parliamentarians of Delhi and Patna, office-bearers of SAARC Chamber of Commerce and Industry, industrialists and traders. Both sides will discuss matters pertaining to promotion of bilateral trade, the Kashmir dispute, Siachin, water and other issues of mutual interests.